Rear Adm. Tom Copeman, deputy chief of staff for Operations, Training And Readiness, received his rear admiral shoulder boards from his wife, Judy, during a promotion ceremony at the U.S. Pacific Fleet Boathouse. Navy Capt. Tom Copeman, was promoted to the rank of rear admiral May on 30. His wife Judy and mother Eileen pinned the new star on the shoulders of the 1977 Punahou School graduate. Copeman, who ran track at Punahou, said he didn't know U.S. Sen. Barack Obama, a basketball player at the school who graduated in 1979. His children, Cara and Tommy, as well as his father, Thomas H. Copeman Jr., a retired Navy commander, also attended the ceremony, according to a Navy news release. At the ceremony Rear Adm. John Bird, Pacific Fleet deputy commander and chief of staff, noted that "the Copeman family has a longtime heritage of serving the Navy - 80 years of collective service from Tom's grandfather to his father and his own." Capt. Thomas H. Copeman, his grandfather, commanded five ships, earning a Silver Star during the Gilbert Island raids aboard USS Brown in 1943 and two Bronze Stars for other Pacific actions in the Marianas and the Philippines. His father, Cmdr. Thomas H. Copeman Jr., served aboard destroyers and cruisers throughout his 22-year Navy career. He commanded the USS Fidelity, served a year in Vietnam, and taught at the U.S. Naval Academy. The younger Copeman, a 22-year Navy veteran, earned his Navy commission in April 1982, and commanded the destroyer USS Benfold and Destroyer Squadron 7, deploying as the sea combat commander for the USS George Washington Carrier Strike Group in the Persian Gulf during both the Iraqi and Afghan campaigns. 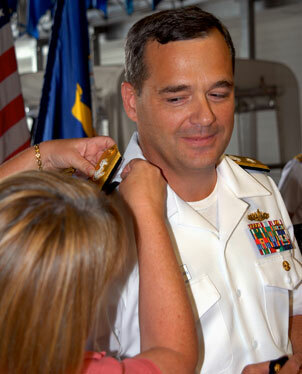 He is currently deputy chief of staff for operations and training for the U.S. Pacific Fleet. Col. Gary Hara, whose Big Island family has a long time legacy with the Hawaii Army National Guard starting with his dad - Lt. Col. Henry Hara - will be promoted to a brigadier general and serve as the Hawaii National Guard's assistant adjutant general, Army. For the past five years, he was the Hawaii Army Guard's chief of staff. Other members of the Hara family who are Hawaii Guard soldiers are: Lt. Col. Kenneth Hara; 1st Sgt. Dennis Hara and Sgt. 1st Class Larry Hara. using bad judgment does not portray the true character or integrity of my son David. It does not show that when he was home on leave, the last thing he would do was buy soft dog food for our aging dog 'Bear.' It does not show the kind and gentle heart of a young man who served his country for 31/2 years of his life. Nor does it show the battles he fought in Afghanistan or Iraq; that he fought for the freedom of the people of Afghanistan, Iraq and the United States of America! "The video released does not alter our opinion of him. The sun rises in the morning and sets in the evening," said the statement, which was published in the Everett Herald in Everett, Wash. The paper attributed the statement to Motari's mother, but chose not to provide a name because the family received death threats after the 17-second video was seen on YouTube in March and had their phone disconnected. "Life goes on no matter how much grief we may be in. My son's life will go on as will ours," the statement added. Motari, 22, was a member of the 1st Battalion, 3rd Marines, and served in Afghanistan and Iraq last year. He was supposed to have been discharged in December. » Capt, Michael H. Anderson, deputy medical officer to the Marine Corps in Washington, D.C, has been selected to the rank of rear admiral and will become command surgeon at U.S. Pacific Command. » Col. Scott D. West, commander of 613th Air and Space Operations Center at Pacific Air Forces, has been selected for the rank of brigadier general and will become chief of staff at the Joint Warfare Centre, Supreme Allied Command for Transformation in Stavanger, Norway.